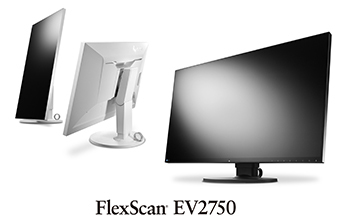 Hakusan, Japan, September 1, 2015 – EIZO Corporation (TSE: 6737) today announced the release of the FlexScan EV2750, a 27-inch IPS monitor with an LCD screen that is flush with the minimalist frame that surrounds it for a fully flat surface. The FlexScan EV2750 features picture-by-picture capability and numerous ergonomic and energy-saving features that make it ideal for business environments such as trading rooms, control rooms, and back offices. The 27" screen uses an LED-backlit IPS (in-plane switching) LCD panel with a native resolution of 2560 x 1440. Its 178° viewing angle minimizes color shift. The typical brightness is 350 cd/m2 and the contrast ratio is 1000:1. EIZO-developed software2 called ScreenManager Pro lets users adjust color and EcoView settings with the mouse and keyboard instead of the on-screen display menu. It also works with EIZO’s EcoView NET power management software which lets network administrators control the brightness and power settings of all compliant monitors. Six preset modes are included – sRGB, Movie, Paper, DICOM, and two modes with user-adjustable settings. Paper mode reduces the amount of blue light to help prevent eye fatigue. USB 3.0 hub with one upstream and two downstream ports. Dual 1-watt internal speakers and a headphone jack. The FlexScan EV2750 is now shipping. Date of availability varies by country so contact the EIZO subsidiary or distributor in your country for details. 1 Ambient illuminance must be more than 500 lux (typical office environment) and viewing distance more than 35 cm. 2 ScreenManager Pro is compatible with Microsoft Windows 10, 8.1, 8, 7, and Vista.